Nugent Sand’s roots are firmly grounded in the foundry industry. For decades Nugent Sand has been a primary supplier of silica lake sand to the Midwest foundry industry. Our ownership, management, quality control and sales team members have direct experience working in a foundry and/or continue to participate in foundry continuing education/training. We strive to understand and be a resource for our foundry clients. Our facilities were designed to provide the ultimate sand controls for Acid Demand Value (ADV), Screen Distribution, A.F.S Grain Fineness, Moisture and Temperature. In some cases, we will design a specific blend to meet a foundry’s specifications and requirements. 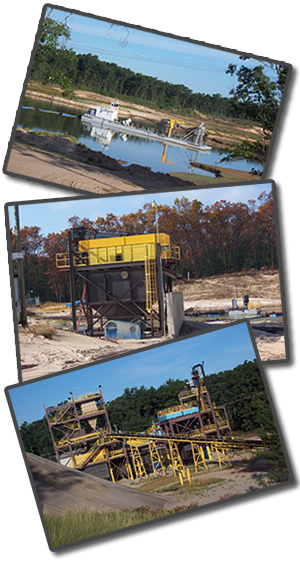 Nugent Sand uses a pneumatic blending system to create a custom sand with an A.F.S. 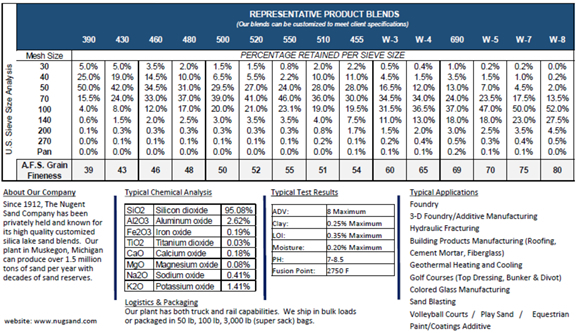 of 39 – 80 to meet individual customer sand requirements. Our superior blending capabilities and quality control procedures allow us to deliver sand within a very tight and consistent range on each required sieve screen. Our silica lake sand is currently being used in a wide variety of metals including Grey Iron, Ductile Iron, Non-Ferrous applications and specific steel applications. For both Cores and Molds, our sand is currently being used in virtually all non-permanent applications including No-Bake, Coldbox, Hotbox, Shell and among other applications. CONSISTENT: Given our quality control procedures and blending capabilities, we are able to consistently every shipment to the client’s specification with minimal variance to that specification. LOWER DEFECTS FOR MOLDS: For Molds, our 4 screen sand has increased density and has more resistance to expansion defects including veins, buckles, scabs and erosion. LOWER RESIN, ADDITIVIES, COATINGS & MAINTAINED STRENGTH FOR CORES: For Cores, our 4 screen sand has consistently increased core density, reduced resin, reduced coatings, reduced sand additives, maintained core strength and increased core productivity. DOLLAR SAVINGS: Many of our clients have seen substantial dollar savings through less resin consumption directly improving their bottom line.